1.) Considering Sizing your Materials For Cleaner, More Durable Flies. When tying flies for commercial appeal and durability, the first thing I consider is choosing the right size of material for the fly. When purchasing materials, I usually buy a wide range of size options when available. When I buy thread, I will buy each size in each color offered; the same holds true for wire, tinsels and other body materials such as d-rib. When starting a tying session to crank out a couple dozen flies, I will set up all my bobbins with the spooled materials first before preparing the other materials. If I am tying small flies smaller than 16, I will spool up either 50D gel spun thread or 16/0 Veevus thread. As I increase hook sizes, I go larger with my thread, wires and tinsels. If I am tying wire bodied or wire ribbed flies, I match my wire sizes accordingly. I would not use a BR sized wire on a size 16 or smaller hook. Instead, I would choose SM size wire. The same with tinsels. 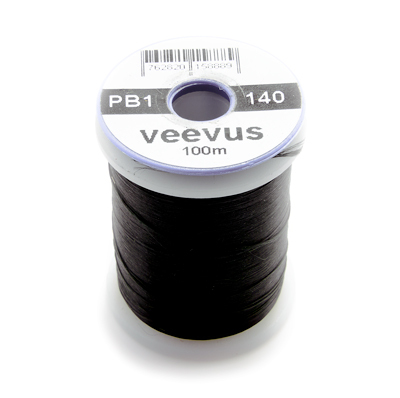 Keeping the threads and wires matched to hook sizes, Helps to reduce the number of thread wraps required to secure the material to the hook and thus make cleaner flies. Too large of thread or wire makes the fly less durable allowing thread wraps to roll off each other or off the hook. Not to mention, too large of thread with too many thread wraps just looks amateurish. Conversely, when tying large flies it is most helpful to gauge your tying thread to the project. Big articulated streamers or bulky materials may require a large denier thread to accomplish the task at hand. All underbodies are applied in one session. You can prep as many undebodies as you want and then draw from that pile when tying other similiar patterns. I will often tie a hundred or more weighted czechs in one session. It is a lot of fun to spend a lazy sunday afternoon in front of the fire rummaging through your boxes of materials tying a few fly patterns that strike your fancy in hopes that it will draw a strike from a handsome fish. This can leave a mess of your tying table and fill your boxes with a hodge-podge of misfit toys. Instead, as I learned from my tying mentor many years ago, tie in batches. Tie at least a dozen (in our case 100's) of each size and color at a time and break the sequence into steps. Breaking down the tying process into logical steps will assist you in developing consistency from fly to fly. I usually begin by gathering all of the needed materials together before starting the tying process. Chefs call this mise en place. After I have all materials prepped and in place, I then proceed with the tying sequences. I will tie all the underbodies for an entire batch in one session. Next, I will move on to the tails and abdomens, then move on to thorax and wings etc,. By tying each section on all of the flies at once you get into a rhythmic pattern of tying. I tend to do the same exact amount of thread wraps on each section of every fly. The second step often involves dubbing the body and ribbing. Where possible, use spooled materials to speed up your tying process and save on waste.